awesome photos submitted by j mckinley on August 9, 2015, 9:19am Great photos of downtown ann arbor. Nice for historical memories. Downtown Ann Arbor submitted by avrogers1 on July 9, 2018, 1:31pm I really enjoy this line of books. As a whole, they are a collection of different topics, each one written by a different author. It seems this publisher has breached almost every imaginable topic for every city imaginable. This one specifically showcases the history of downtown Ann Arbor. The photos are fantastic and the captions are well-researched. It's a Wonderful look at a piece of Ann Arbor's history. Love This Series submitted by majean on August 5, 2018, 2:03pm It's so much fun to look back at these photos and compare with today. Charleston, S.C. : Arcadia, 2014. Description: 127 p. : ill. ; 23 cm. Ann Arbor (Mich.) -- History. 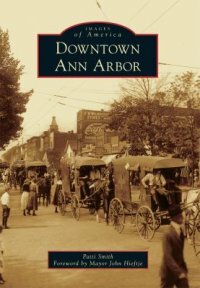 Ann Arbor (Mich.) -- History -- Pictorial works. Ann Arbor (Mich.) -- Social life and customs -- Pictorial works.